It had been a wonderful but wet week in Scotland, and the beach bothy really needs one of those combination washer/dryers that I've only run across in the UK. Unable to dry washing outside on the whirligig, we had to put up the drying rack inside. Not only did that take forever and a day to dry the clothes, the rack took up so much space that it was a logistical nightmare to get from one room to the other. I have a feeling it won't be long until the owners have purchased the combo washer/dryer, since they've already talked about it. I got our two 22-inch carry-on bags packed as well as my book/camera/knitting bag. Denis took care of all his electronic gizmos, and loaded everything into our rental car. With a long drive on single-track roads, we had to leave bright and early Saturday morning to be on time for our train in Inverness. The next stage of our trip was about to begin. Denis and I weren't happy about leaving and wished we could have postponed it a day or two because Saturday marked the first day of the Durness Sheep Dog Trials. 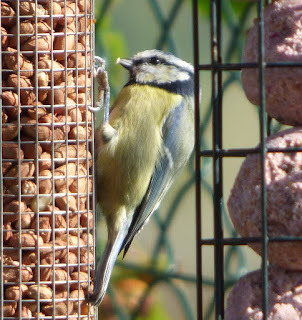 Having seen a few minutes of one being held in the beautiful little village of Luss (by Loch Lomond) a few years ago, I'd dearly love to see more. But it wasn't meant to be. We did, however, get a tiny little preview that put huge smiles on our faces. 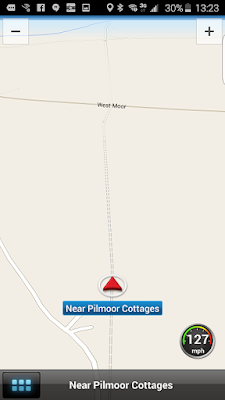 We'd just made the turn onto the road that would take us to Inverness. We weren't even out of Durness yet when Denis had to come to a complete stop. 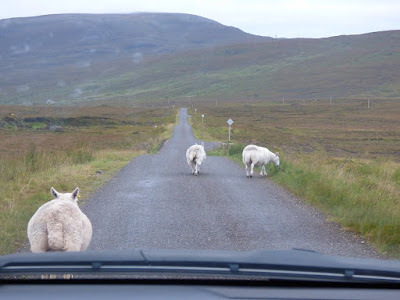 There were a dozen sheep completely blocking the road and showing no inclination to move. Before we could even say anything to each other, a man on an ATV came roaring up, and a black and white Border Collie jumped down from the back. Literally within seconds, the dog rounded up the sheep and got them out of the road. We exchanged cheery waves with the shepherd and continued on our way, feeling that we'd been given a little preview of those sheep dog trials. It didn't take long for me to see that the sheep in Sutherland behave differently on weekends than they do during the week. During the week, it's common to see sheep on either side of the road. They're placid and make no move to dart out in front of your vehicle. Not so on weekends. Several times Denis had to slow down or stop for woolly critters ambling from one side of the road to the other. At least we weren't trying to travel after lambing season, when those gorgeous little ones would be out and about and not having a clue about how to conduct themselves in traffic! We filled up the gas tank in Inverness, turned in the rental car, and were driven to the train station. The man driving us just happened to be fairly well acquainted with Arizona and told us that he was planning a trip to Monument Valley. It was nice to share our knowledge of the area with him. It was walking about the station and getting aboard the train that reinforced feelings we'd been having about our two SwissGear "Zurich" 22-inch wheeled duffle bags. (Yes, there's a reason why I'm being very specific on what type of bags we had.) The packing space was perfect for us both, but they are not the sort of bags you want to travel with. They do not stand on end. Even lightly packed and pulled along on their own, they love to "turn turtle" (flip over on their backs). Heaven help you if you put the handles of another bag over the telescoping handle of the SwissGear (or vice versa) because trying to navigate them anywhere turns into an absolute nightmare. All the outside pockets don't lock either, but that didn't bother me. I didn't even pack enough stuff to need to use all those pockets. If you're thinking of traveling by train in the UK, do your research. 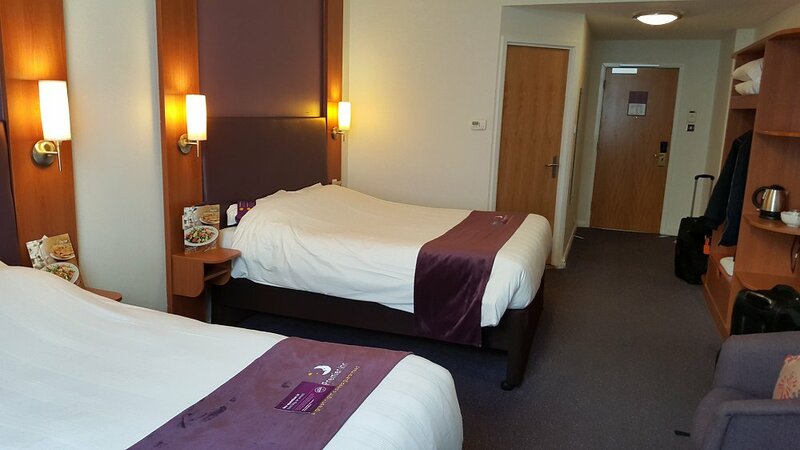 Buying a Two Together Railcard valid for a year gave us some incredible deals and allowed us to travel first class from Inverness all the way back to London. And if you do that research, you'll find that sometimes you can travel cheaper first class. 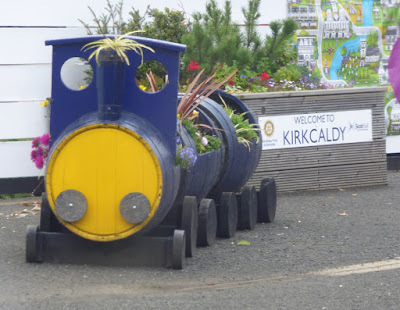 Once settled in first class on our train from Inverness to Edinburgh, I noticed these little trains at each station made from recycled oil drums. Aren't they cute? Scotland's trains are a clear indication of the Scottish attitude toward the class system. 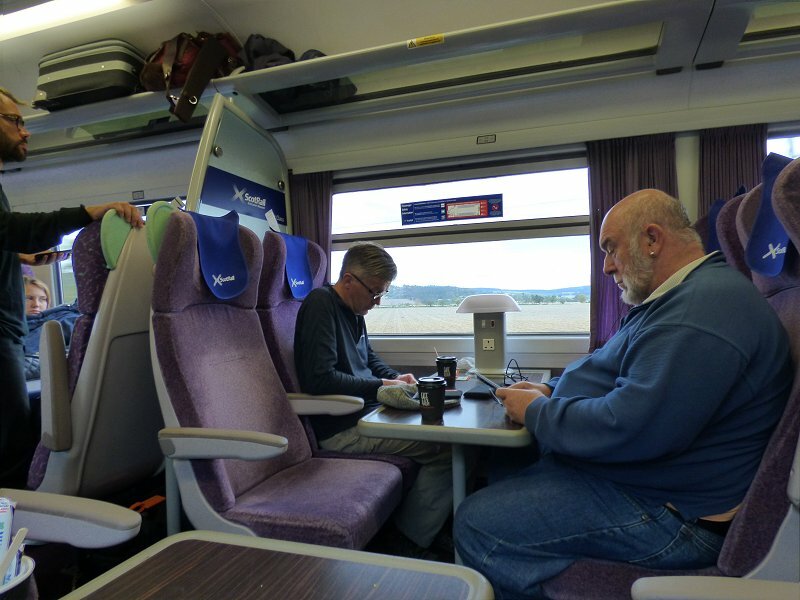 Scots tend to believe-- as we all should-- that no one is better than anyone else, and that's what first class is like on their trains. The center aisle is narrow, so are the seats and tables, and there is very little legroom. 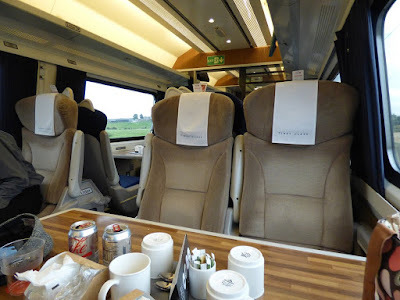 The only difference between first class and the rest of the train was the woman with a cart who kept going up and down the aisle, plying us with food and drink. I had a wonderful chat with the woman sitting across the table from me. She was meeting friends in Edinburgh for a weekend of quilting, and she worked on her quilt pieces as we talked. I kept getting distracted by fields filled with pheasants. As we went through town after town, I realized why there were coffee table books about train stations. There are some gorgeous ones in the UK! Once we arrived in Edinburgh, it was yet another race to get our bags off the train, up the platform, find our next platform, and race for it. After a week of chill and rain, my knees were incredibly painful, so getting on and off a train was not easy. I was also hampered by the fact that I couldn't seem to see through the proper part of my bifocals when trying to disembark. There I was, ignoring knee pain, fighting that bloody SwissGear bag, maintaining a death grip on my other bag, and trying not to fall down "the gap" (that potentially deadly space between the platform and the train) when all of a sudden there was a firm gentle grip on my arm. A young woman who looked to be barely twenty (if that) had seen my dilemma and walked over to help me. I have to admit that, although her help made me feel old and decrepit, I wanted to hug her and find her parents to tell them what a marvelous daughter they have. Out of all the people in that bustling station-- or any of the other stations we were in-- she's the only person to offer help. All I could do was smile so hard my face almost split and give her my heartfelt thanks. Once she saw I was all right, she headed on her way. May you have a wonderful life, m'dear! Now I had to try my best to keep The Jackrabbit (AKA Denis)in sight. Fortunately I was within a few yards of him when I looked down and saw my Inverness yarn purchase spilling out all over the station floor! Denis has poor hearing and was further hampered by having only one working hearing aid, so... I bellowed his name. I bellow quite well when I put my mind to it, and several people, including Denis, stopped to see what the emergency was. First class on a Virgin train was a completely different kettle of fish from that of the train from Inverness. The class system is alive and well down there, I guess. Wide, comfy seats, big tables with charging stations for electronic devices, legroom, and wonderful food and drink. I wasn't hungry but let myself be tempted by the lemon and elderberry flower cake anyway, simply because of its name. Scrumptious! In no time at all, we were pulling into the Durham station where we were met by our good friend, Angela. After taking us to her home where we unloaded our luggage and caught our breath for a little bit, she took us out to her favorite Thai restaurant where we had a delicious meal. The next day called for relaxation and conversation, and we did this in style. We've known Angela for several years and have stayed in her home before. She is the perfect hostess. 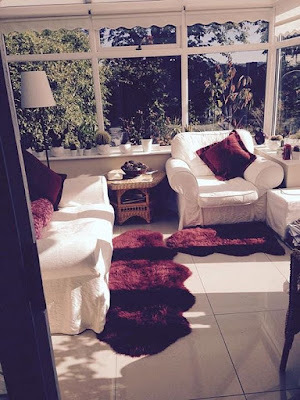 After preparing a full English breakfast for us, we went out to her conservatory, where she kept plying us with big cups of tea. In fact, she hooked me on two flavors of Twinings green tea: Cherry Bakewell and Caramelised Apple. Although not sold in the U.S. I was fortunate enough to find them at Amazon so I could continue my addiction stateside. As the morning mist wore off and the sun began to shine, I could feel my inner solar cells start to recharge. Spending those hours in Angela's conservatory I knew that if I should ever find myself living in the UK, I would have to have one as part of my house, too. The other two checked Facebook while I knitted, and the flow of conversation continued. We were old friends enjoying each other's company. After doing a couple of loads of laundry for me (did I tell you she's fantastic?) Angela took Denis into Durham to make a purchase, and I moved outside with my book and my camera. Angela feeds birds, you see, so you know what I was after. After a splendid meal (did I mention that Angela loves to cook? ), we adjourned to the lounge (living room) to watch television, and this is when Angela made me cry. (Hopefully she didn't notice.) Although we haven't talked about it for years, she remembered that I loved watching a UK gardening program called Ground Force and that I adore Alan Titchmarsh. What did she do? Back in August, she recorded episodes of Alan's latest program, Love Your Garden. Her thoughtfulness overwhelmed me. Should I also mention that we watched the second episode of the new season of Downton Abbey? Probably not! Monday morning had Angela dropping us off at the train station. She had given this slightly grumpy traveler exactly what she needed: good conversation, good food, good rest. Anyone she invites into her home is treated like royalty, and I am so happy to be able to call her friend. Angela? YOU ROCK! The train to London was another Virgin train, and we were whisked through the lovely English countryside with intriguing views of ancient buildings. One last time for getting my luggage and me off a train and rabbiting after Denis through King's Cross Station (no, I didn't look for Platform 9¾) found us standing in a huge queue (line) for a taxi-- and I'll have you know that this was the first time I'd ever been in one. The drive through central London was whiplash-inducing-- again-- as I tried to take everything in. Despite road construction, the driver almost got us to the door of our hotel, the Premier Inn County Hall. 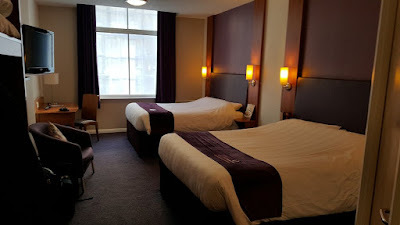 I can't begin to tell you how much my knees hurt, and trying to get my bags up the steps and into the hotel reminded me of one of the drawbacks of a listed building: the entrance would not have conformed to the Americans With Disabilities Act. Although I applaud the UK for not demolishing or otherwise chiseling into and changing their important buildings, at that moment I would've given almost anything for a ramp into the hotel! The photo above was taken a block away from the hotel. If you left click on the picture to see it in its original size, look for the red doubledecker bus down the street. It's right at the intersection where our hotel is. 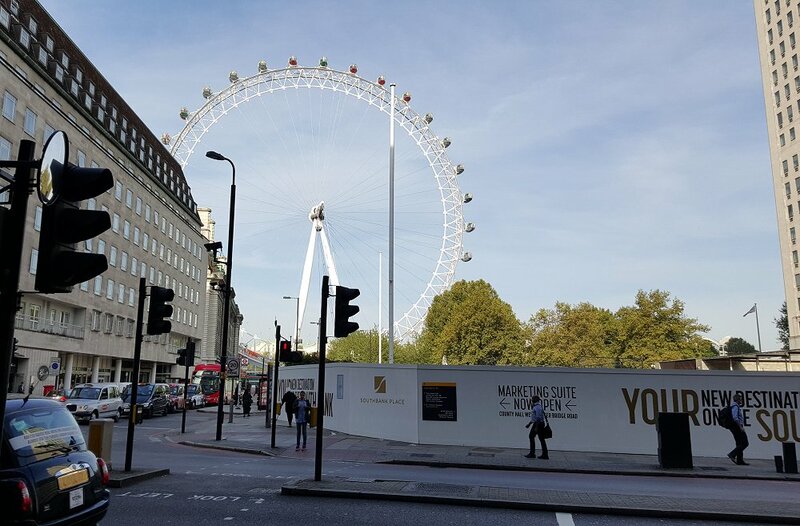 You can also see that the London Eye is right behind the hotel. Right across the River Thames is Big Ben and the Houses of Parliament. Not a bad location, eh? In case you're wondering why a photo was taken from that particular spot, it's right outside the business where we would buy our tickets the next morning for the tour bus that would take us exploring. The only "bad" thing about our room was that the window looked out into an interior courtyard, but neither one of us minded. We had ample hanging space for our clothes. Someplace to put our bags. A desk and chair. A comfy chair if I wanted to sit and knit. A nice telly with plenty of channels for any last minute British program bingeing. And one big bed EACH. We were tired and hungry, so after relaxing for an hour or so, we went down to Thyme, the hotel restaurant where we had excellent meals. Then it was back to our room to do a bit more relaxing and get some sleep. We had a lot of exploring to do the next day! Wow! What a wonderful trip, even though the sore knees and bifocal problems were rough. Angela sounds like a fantastic person and you both had a great time -- a perfect stay. That conservatory is perfect. Love the sheep and border collie story. Seeing Scotland and England from a train is also great, as is the hotel room. Oh, Cathy! Remind me not to get that kind of luggage! What an absolute nightmare that must have been! And your poor legs, too. I'm glad, though, that you had some good train rides (you're right; if you know what you're doing, you can get great deals on trains), and that you had some Angela-pampering. She sounds terrific. Looking forward to hearing about your next adventure. Good advice about the luggage, it can be so difficult getting around with bags that don't behave. Looks like you stayed in a good location in London and your friend sounds awesome, lucky you. You're reminding me of how exhausting travel can be, and of those respites that make it all worth while. Looking forward to next week's installment.